I am always looking for something healthy to have for breakfast other than homemade bread or cookies. This is something I discovered recently while on vacation. It may not be new to most but for me it was a discovery I just loved. The best part is that I can snack on something healthy instead of junk food. Preheat oven to 150C (130C fan mode). Line the baking tray with parchment paper. 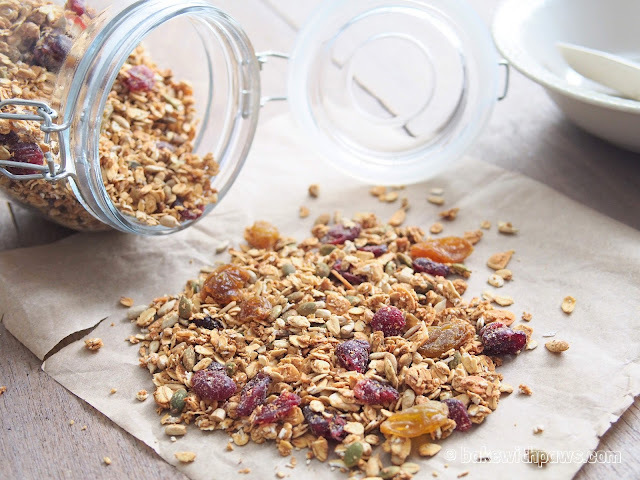 In a big mixing bowl, combine all the dried ingredients (except raisins and cranberry) and mix well. In a small bowl, whisk egg white, honey and coconut oil together with a small hand whisk or fork. Add the wet ingredients mixture to the dried ingredients. Stir until all well combined. Spread the mixture onto the prepared baking tray. Bake at the preheated oven for 45 minutes. Stir the mixture every 10 to 15 minutes to make sure all are even baked. Remove from the oven, stir in cranberry and raisins. Leave the granola to cool completely on the tray. Store in airtight container. It is best to eat with milk, soy milk or yogurt. You may replace egg white with extra honey or maple syrup and coconut oil if you don't want to use egg white.